I've come across quite a few good things around the ol' internet (and elsewhere) that I've wanted to share lately, so I thought it would be the perfect time to start doing a few of these posts here and there! Good deals I've come across, posts of note, quotes I love, and other such things. + Citrus Lane is having their semi-annual sale right now, so for those of you who have been interested in snagging a subscription, now is the time to do it! The boxes are as low as $18/month during this sale. (I found that most boxes I received had a retail value between $30-$40—sometimes higher. So, $18 isn't too bad when you can use the items to stock up for Christmas or birthday gifts!) We received many of these boxes throughout Eisley's first couple years and were always happy with the goodness tucked inside. You can read a few of my box reviews here, here and here. + I'm sure this article over on Babble has made the rounds already, but I just loved it so much. The author writes about the moment she realized her worth as a stay-at-home-mom, and how much her role benefits not only her children, but also her husband. It was a unique perspective, because you rarely hear anyone mention how having a stay-at-home-spouse can be a luxury the one working outside the home. Pretty awesome to read—especially for those of us who have struggled with feeling like what we do at home is as important as what our spouse does outside of it. + The most recent issue of Real Simple has a Q&A with filmmaker Ava DuVernay, who shared how she made the leap into filmmaking. Of her first film, she says: It was imperfect and crazy and nerve-wracking and not good, but I did it and then just kept going. Her words really hit me hard, and made me think about how often failures or imperfections make me want to quit something (even when it's something I love). Her first effort wasn't perfect or brilliant or everything she hoped it would be. But she kept going, and now she's doing amazing things. + Crystal's post on Money Saving Mom about perfectionism and disappointing readers was such a breath of fresh air. I'm a total people-pleaser and struggle with a lot of the same things she has, and can't imagine having a platform of her size (and all the expectations and criticisms that inevitably come with it!). 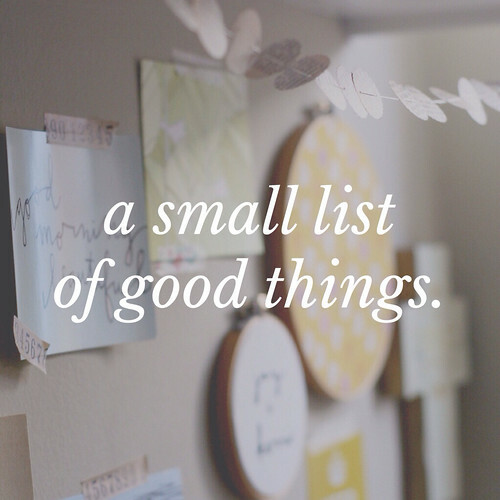 Be sure to pass along any good things you've come across lately! I'd love for you to share. Affiliate link included in this post. If you make a purchase at Citrus Lane through my links, I will receive a small commission at no extra cost to you. Thank you for your support!